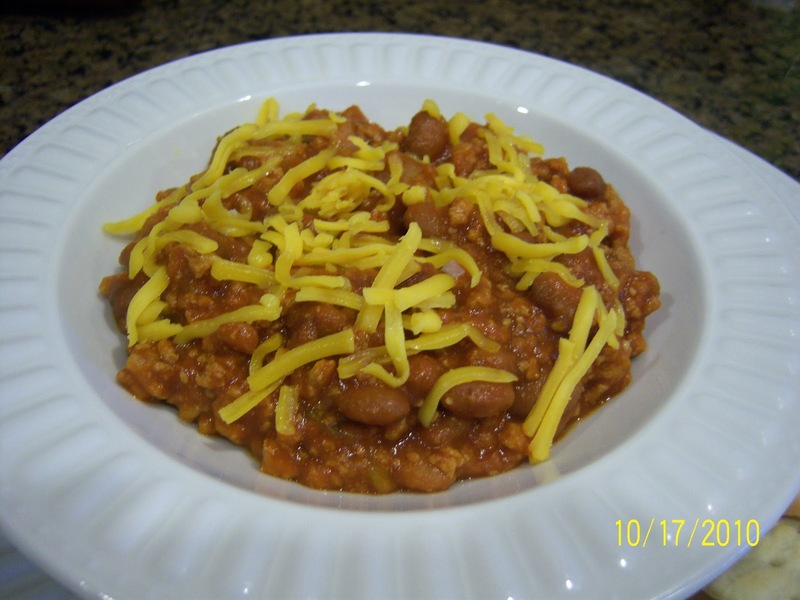 When the weather is cold outside there is nothing like a nice bowl of chili. Especially if it's been cooking in the crock pot all day and has the house filled with it's delicious aroma. Sunday is my favorite day to have a crock pot meal. Start it early in the morning... dinner's done. No more wondering what to make for dinner and you're free to enjoy the morning at church and time with family. This is really easy to make because you just eyeball it... add the ingredients to suit your own taste. Use as much or as little as you like. More veggies, or less. More beans or ground meat, that's ok too. If you like mild chili use less seasoning. Or use more if you want to spice it up a bit. This is the chili I've been making for years. I don't have an actual recipe... the amounts are just approximately what I use for my 5 quart crock pot. You can cut it in half if you'd like, but it freezes very well... you could freeze the rest for another meal. Brown the ground turkey in a large skillet. Add garlic, onions and green pepper and cook until veggies are beginning to soften. Drain if necessary. In your crock pot, add the meat with the veggies. Add the chili beans, with their juice, to the pot. More or less is fine... just add what you prefer. I like to stir the beans into the meat mixture to be sure I have enough. Next, add 2 cans of tomato sauce and 1 can of tomato paste. Add the chili seasoning and mix well. At this point, I like to leave it and let it cook on low for a few hours before I add more tomato sauce or paste. Sometimes there is more liquid in the pot than you realize when it cooks down. If after a few hours it seems too thin, add more tomato paste. If it's too thick, add tomato sauce or a little water. My family likes this with shredded cheddar cheese on top and served with saltines, oyster crackers or cornbread. It's great that way. 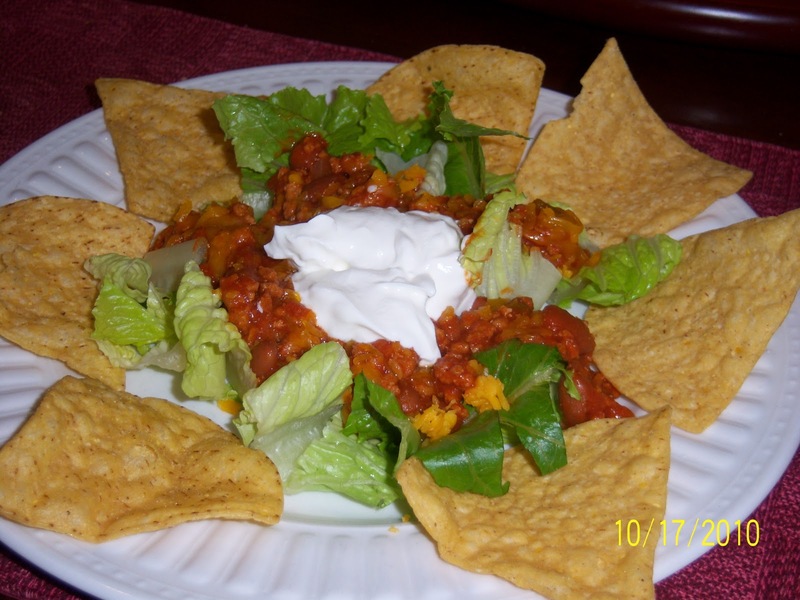 We also like to make taco salads.... spoon chili over chopped lettuce, top with diced tomatoes, sour cream and cheddar cheese and serve with tortilla chips. Makes a great meal. 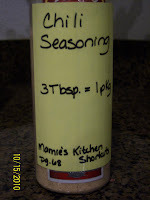 And if you'd like to make your own chili seasoning... here's the recipe. It's from the book "Marnie's Kitchen Shortcuts". It's a great little book that I've had for years, and I still return to it often. Mix together. Store in a cool, dry place. 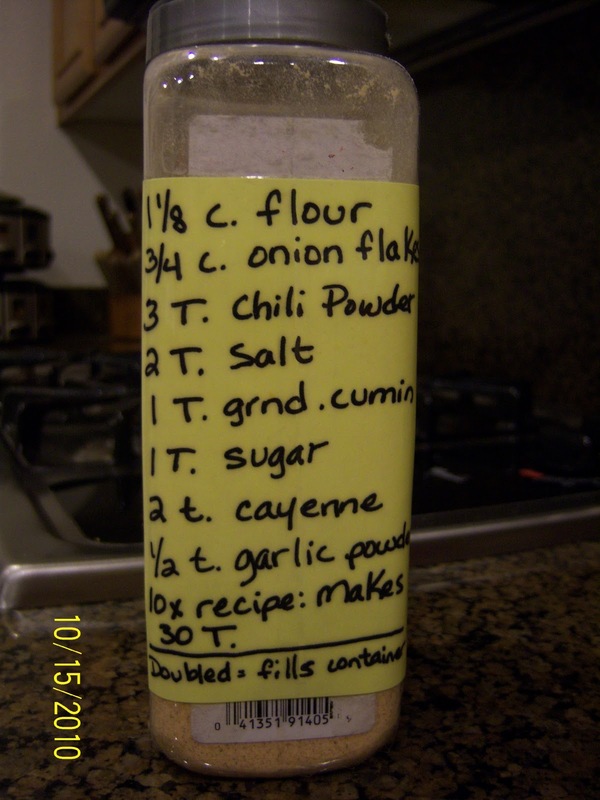 Makes 30 Tablespoons. 3 T = 1 pkg. 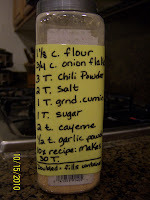 seasoning mix. ﻿I buy spices in bulk and save the containers when they're empty. I use them to keep similar spice 'mixes' in. 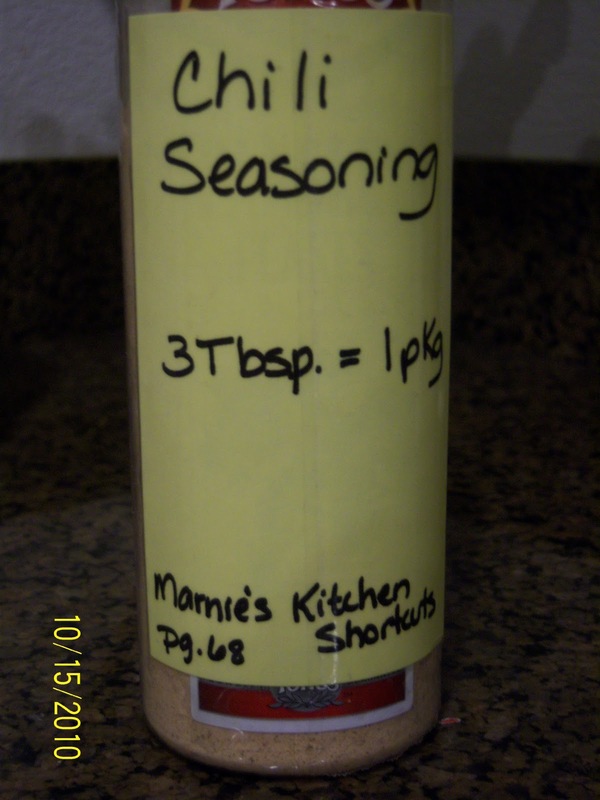 I use an index card to write the ingredients on and the book I got the recipe from, and I tape it to the outside of the container. Works great!